The Canadian forest products industry has achieved strong advances in labour productivity even while facing one of its worse downturns. But productivity in paper mills lags behind the performance of the rest of the sector. A detailed analysis of productivity trends in the Canadian forest products sector was undertaken by the Centre for the Study of Living Standards (CSLS) for the Forest Products Association of Canada (FPAC). The independent study shows that between 2000 and 2012 the labour productivity of the Canadian forest products industry grew at a compound annual rate of 2.5%, well above the overall Canadian business sector growth of 0.7%. The advocacy group Democracy Watch says it is not too late for the New Brunswick government to abandon an agreement with forestry giant J.D. Irving Ltd. and send it out for public hearings. The agreement with J.D. Irving Ltd. offers increased access to wood from Crown land in exchange for future investment and jobs. It is part of the government’s new Crown land policy that gives more softwood from public forests to Crown licence holders like J.D. Irving. Duff Conacher, a co-founder of Democracy Watch, a group that pushes for government accountability and democratic reform, called the forestry agreement with J.D. Irving Ltd. a misstep in a series of missteps. A twenty-five year-deal released April 25 between J.D. Irving and the government of New Brunswick has given the former more control over the province’s forests. This new agreement comes into effect on July 1. The province will be moving away from its long-held “prescriptive-based approach”, one characterized by heavier governmental regulations, towards an “outcome-based management”—shifting the focus towards economic development and allowing J.D. Irving a greater supply of wood from government held crown land. In exchange, J.D. 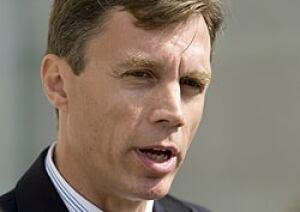 Irving will have to invest $513-million in its New Brunswick operations. The province intends to boost softwood production by twenty per cent over the next ten years. International Paper has been awarded a $500,000 prize courtesy of the Port of Virginia’s Economic and Infrastructure Development Grant Fund. The grant is a feather in the cap for the Memphis, Tenn.-based company, the largest paper and pulp manufacturer in the world, after the company reopened its shuttered pulp mill in Franklin two years ago. The decision to close the facility in the wake of the 2008 economic crisis saw more than 1,000 employees laid off at the plant after more than a century in operation. British imports of sawn and planed lumber have increased in value by 33% or almost EUR 50 million in the first two months of 2014, according to the latest figures provided by Eurostat. Imports from the European Union countries, which represent more than 90% of all UK softwood lumber purchases, grew by 32% as compared to January-February 2013. Notably those from Sweden (+42%), Finland (+18%) and Latvia (+51), the first three main UK suppliers. EDMONTON – Some Alberta environmentalists say a national agreement between the forestry industry and conservation groups isn’t working in the province. Keepers of the Athabasca and the Alberta Wilderness Association say logging is still going on inside caribou habitat and in buffer zones set up to protect the animals’ ranges. In the Canadian Boreal Forest Agreement reached four years ago, major forestry companies agreed to preserve forests and environmentalists ended a boycott and media campaign against those companies. Twenty-three fallers in Smith Inlet, BC, Canada are taking part in a pilot study to learn more about how they sleep. They are wearing watch-like devices – called a Readiband™ – on their wrists for three weeks. The band collects data on sleep quality, and uses it to create a report that will lead to better sleep outcomes for each individual’s situation. …“The less sleep you get, the more likely you are to have an accident at work,” said Fatigue Science’s Pat Byrne, also known as the Canucks sleep doctor. …“Our message was that the forest industry needs to pay attention to that and start looking at why it’s an issue,” he said, adding that he and his team were working on a project with the BC Forest Safety Council. Outside a small office on main street, big trucks rumble through the tiny town of Council on their way to somewhere else. They all have one thing in common: none of them carry logs or lumber. Mark Mahon’s father and grandfather spent their careers in the logging industry. Now he helps run the family business, Tom Mahon Logging. The 14-person outfit can harvest 14 million feet of timber. Third generation logger Mark Mahon says that’s a far cry from when he grew up in town in the 1970s and 80s. …It wasn’t just jobs that were lost as the national forest logging heyday began its downward slide. Some of the money that communities got from the federal government was affected as well. …Mahon says his family has managed to hang on to their 14-person logging operation. But he says loggers are constantly running up against federal regulations when it comes to cutting trees on the national forest. There is a ghostly redwood forest in Yellowstone National Park. The trees are identical to the massive pines that grow 200 to 300 feet tall in California. The difference is that the Yellowstone redwoods are petrified, not alive. …About 55 million years ago a vast inland sea that had once covered large portions of Montana was retreating to the east. 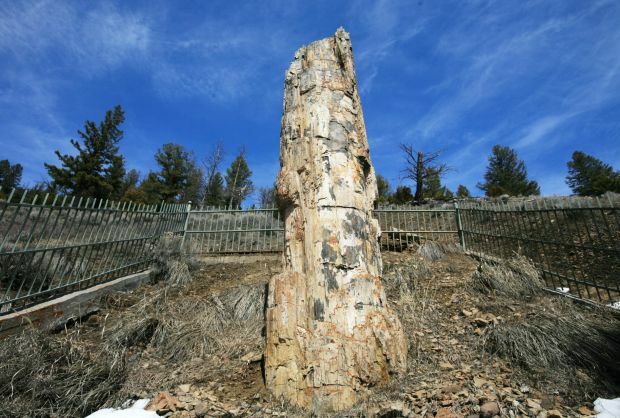 …It is the remnants of these trees that are now found standing upright at different elevations for about 20 miles along the northwest end of Specimen Ridge in Yellowstone, in what is widely regarded as the largest fossilized forest in the world. ANCHORAGE, Alaska – An Alaska Forestry Division spokeswoman says a fire in the Kenai National Wildlife Refuge has burned across 179 square kilometres. While smoke is thick around Soldotna and Kasilof, fire officials say there’s no known damage to structures. Spokeswoman Michelle Weston says the Funny River wildfire has grown from an estimated 8,000 hectares Tuesday night to more than 18,000 hectares Wednesday. Some of that change has to do with the difficulty of mapping the smoky fire. The human-caused blaze started Monday. CHICKASAW COUNTY – A battle against a growing southern pine beetle infestation in Mississippi’s Tombigbee National Forest will be fought by the U.S. Forest Service using designations authorized in the 2014 farm bill. The U.S. Forest Service yesterday officially designated portions of the Tombigbee National Forest as a landscape-scale insect and disease treatment area that is subject to expedited environmental and administrative requirements. …The Tombigbee National Forest designation is part of an announcement that includes the designation of treatment areas nationwide encompassing 45.6 million acres in 94 national forest areas in 35 states. 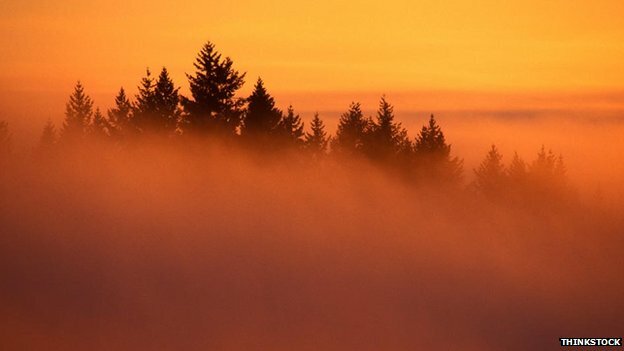 Helicopters are being used to track the spread of a disease affecting larch trees across forests in Wales. The aerial surveys conducted by Natural Resources Wales (NRW) suggest the disease may not have spread as much as in previous years. This year 10 sites containing 40,000 trees are under further investigation. In 2013, NRW found around 3m trees over 3,000 hectares were affected. Wet weather in 2012 could have helped phytophthora ramorum spores to spread. 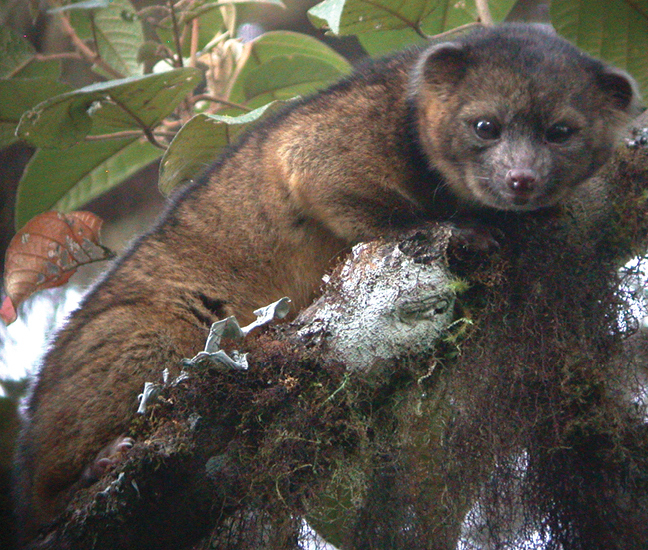 A top 10 list of species discovered in the last 12 months is topped by the olinguito, a carnivore dwelling in the treetops of the Andes This racoon relative caused a stir after a neglected specimen was first discovered in a Chicago museum drawer. This story is an annotated slide show. The so-called symbiotic relationship between trees and the fungus that grow on their roots may actually work more like a capitalist market relationship between buyers and sellers, according to the new study published in the journal New Phytologist. Recent experiments in the forests of Sweden had brought into a question a long-held theory of biology: that the fungi or mycorrhizae that grow on tree roots work with trees in a symbiotic relationship that is beneficial for both the fungi and the trees, providing needed nutrients to both parties. These fungi, including many edible mushrooms, are particularly common in boreal forests with scarce nutrients. But in contrast to the current paradigm, the new research shows that they may be the cause rather than the cure for the nutrient scarcity. Scotland’s forestry and timber industry has said not enough trees are being planted now to meet expected demand for wood in 50 to 100 years time. Industry body Confor said trees for commercial use could take up to 40 years to grow but that there had been a fall in planting since 1990. 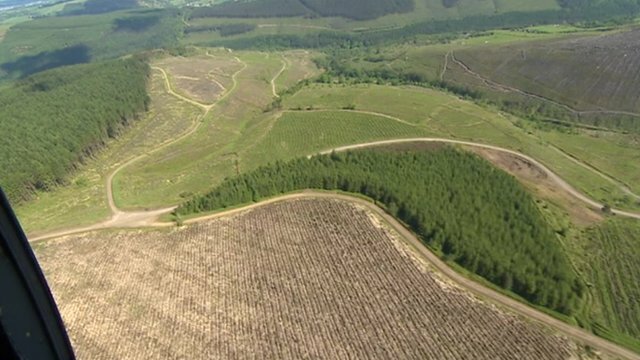 Public agency Forestry Commission Scotland said there were good levels of supply for the next 20 years. It said it would need to work with the private sector to meet later demand. 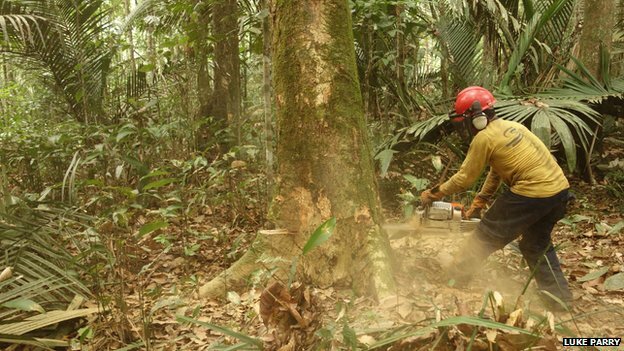 The amount of carbon lost from tropical forests is being significantly underestimated, a new study reports. Experts say that in addition to loss of trees, the degradation of trees by selective logging and fires causes large amounts of “hidden” emissions. The slow moving process has remained almost invisible to satellite observations. The study team say that 40% of carbon emissions from deforestation in the Amazon is due to degradation. The Renewable Energy Association (REA) will today welcome the newly formed Wood Heat Association (WHA) as an affiliate trade association. The announcement will be made later this morning by REA Chief Executive Dr Nina Skorupska and the WHA’s Neil Harrison at the All-Energy Exhibition & Conference in Aberdeen. Wood heat is the fastest growing source of low carbon heating for UK homes and businesses under the Government’s Renewable Heat Incentive (RHI). Biomass accounts for 56% of investment and over 90% of energy generation under the scheme between 2010 and 2012, demonstrating its excellent value-for-money. The 700+ companies across the UK wood heat supply chain support approximately 13,500 jobs.